This scene shows Circle Mountain in the background and the river flowing southwest not far from Hillcrest Country Club. 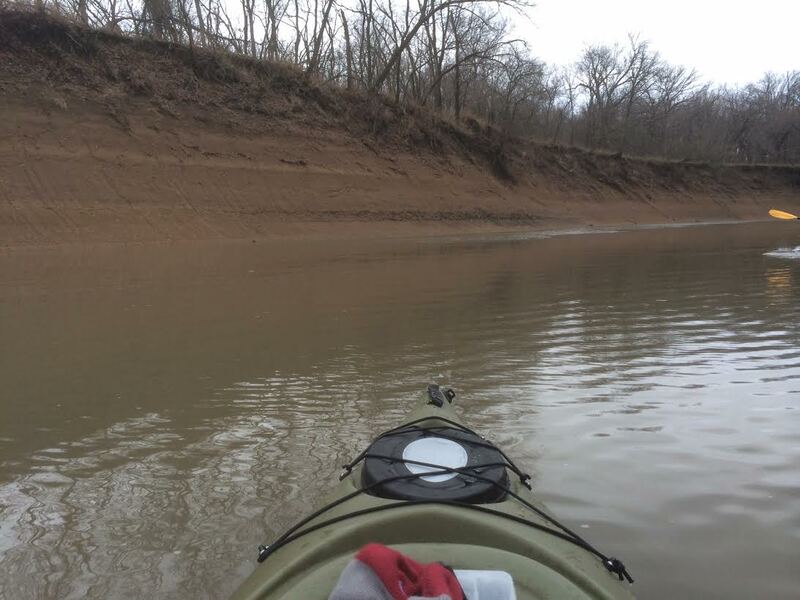 I’ve always been aware of the river, since I grew up in Bartlesville, and I’ve watched it at flood and drought stage, muddy, serpentine, hardly a river one would call beautiful. Looking south toward the old and new, the arched concrete structure of the 7th street bridge and the steel and concrete of the new Adams Blvd bridge. 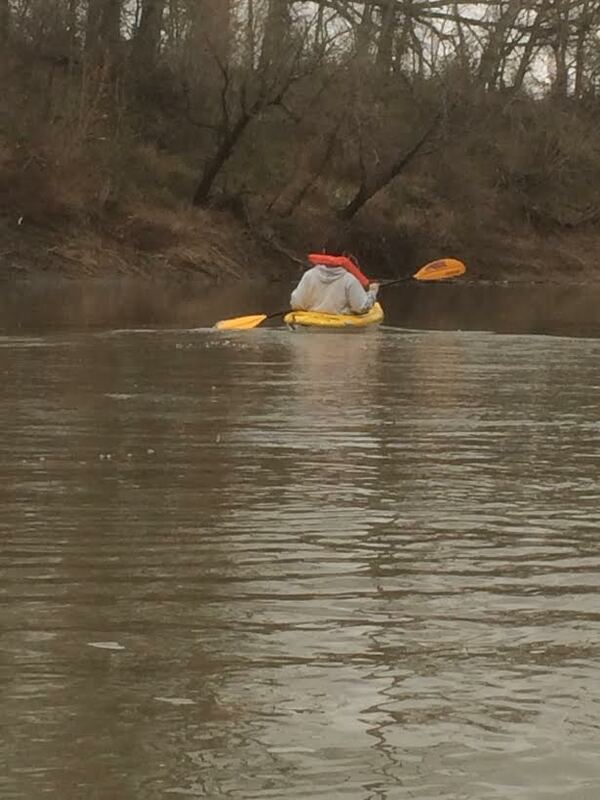 But as we paddled lazily along the shoals of the now gentle, rippled river, I found myself both proud and ashamed. Proud that this river shapes the contours of a beautiful historic city, and that like a plain-faced lass made beautiful in the shadows of a glowing fireplace, this river was somehow made enchanting in the soft pastel of late winter sunlight. 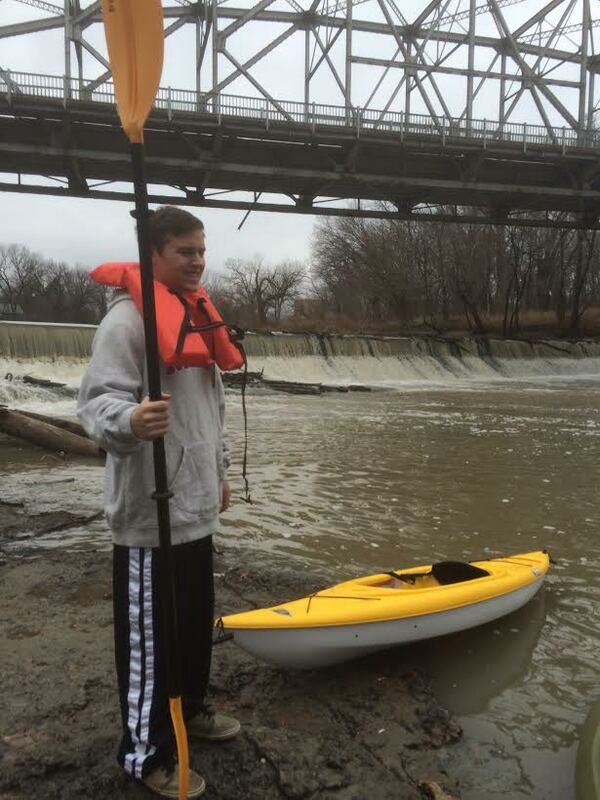 Brandon ready to launch into the shoals below the Cherokee bridge. 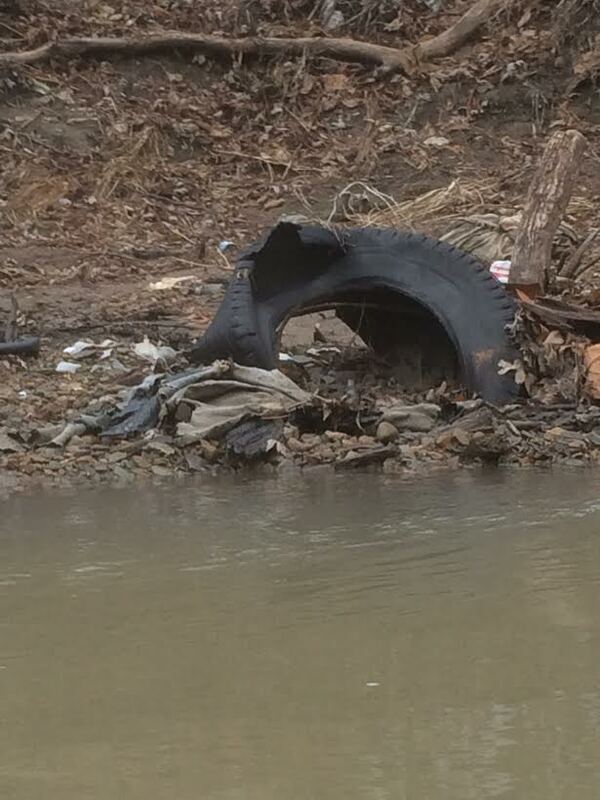 Ashamed because the river swelled with the refuse of my grandfather’s generation–oil drilling pipe and cable–my father’s, bold all-white sidewall tires–and my generation, plastic trash bags and aluminum cans. 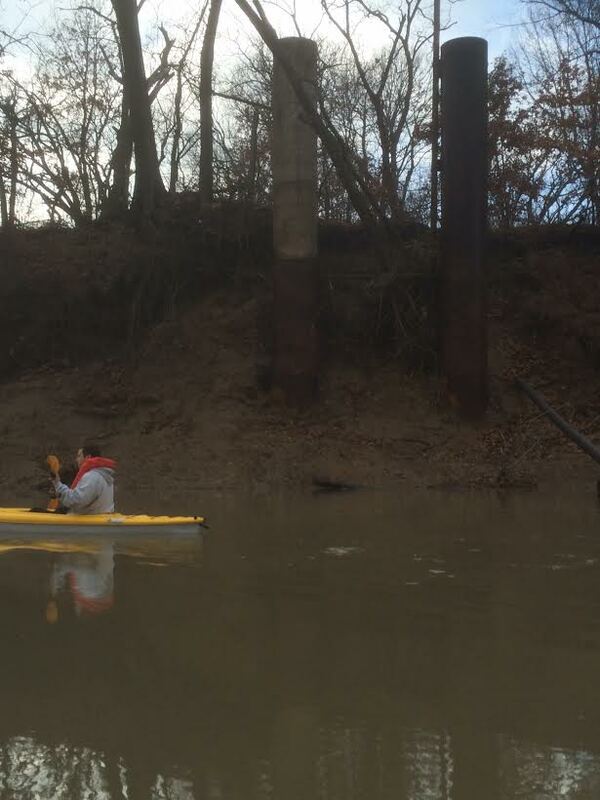 We paddled past the discharge pipe of the sewer treatment plant, maneuvering as close as possible to the arc of the water spilling from the pipe. It seemed clear and smelled like fabric softener, perhaps they add Febreze? 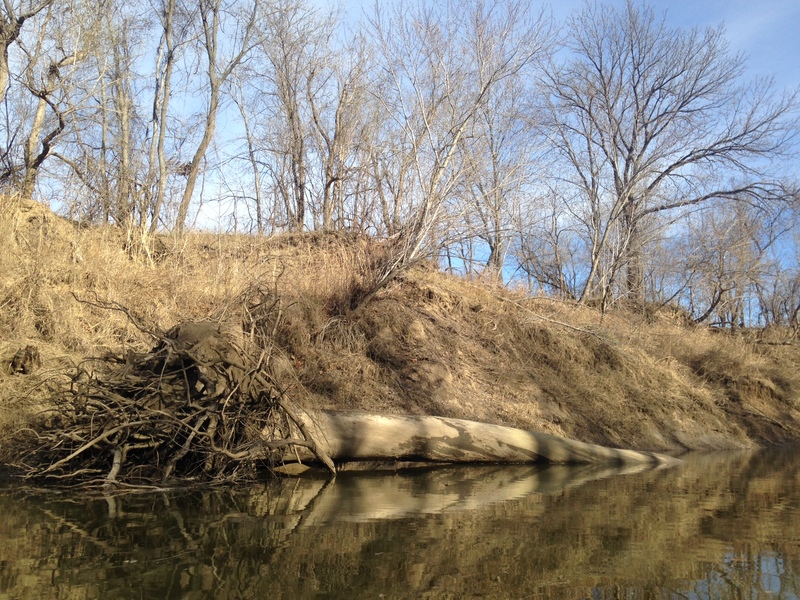 The high sandy east bank of the Caney, just east of high school. 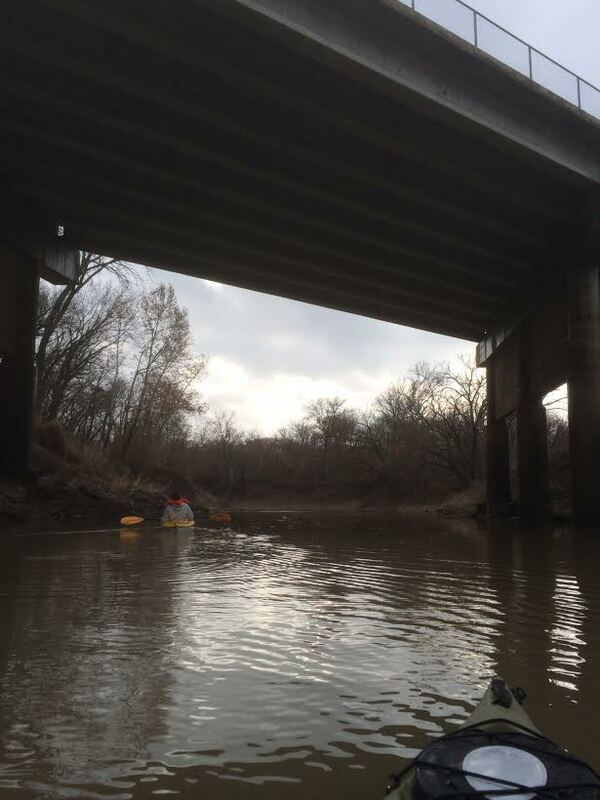 We passed under the support structure of the Tuxedo, Frank Phillips and Adams bridges, paddled past the mobile home park, the high school, and disembarked just below the Pathfinder bridge just west of the Wesleyan church on Silver Lake Drive. 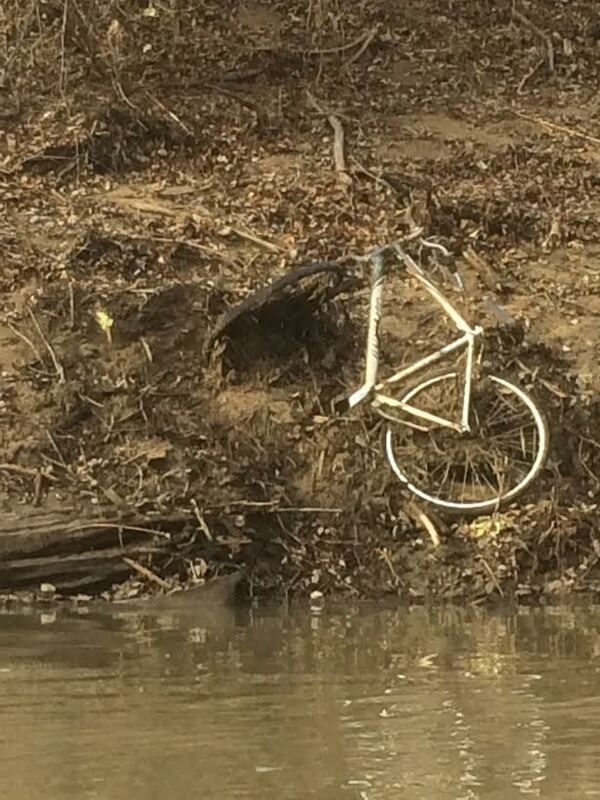 An old bike was just one of many modes of transportation abandoned to the silt and flow of the river. 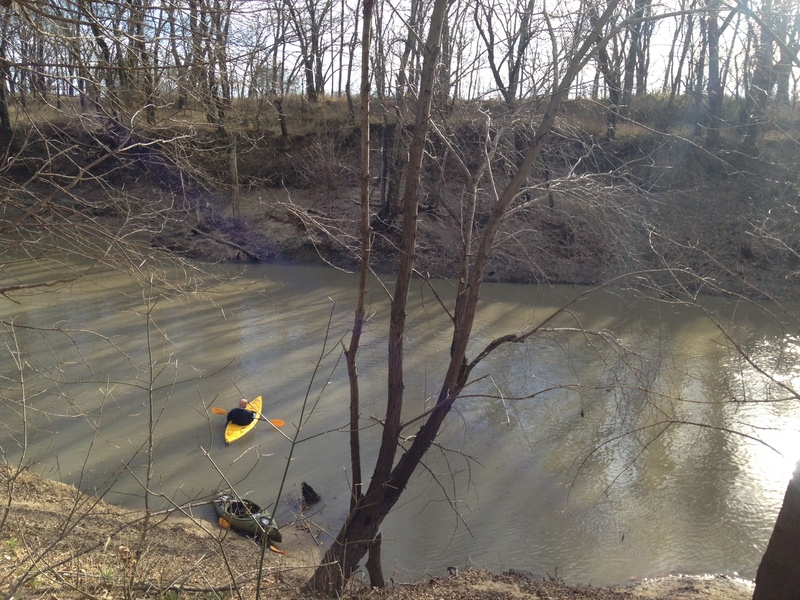 We saw a hundred old tires, rusting shells of old Model T era cars, an old paddle boat, and lots of oil field equipment. 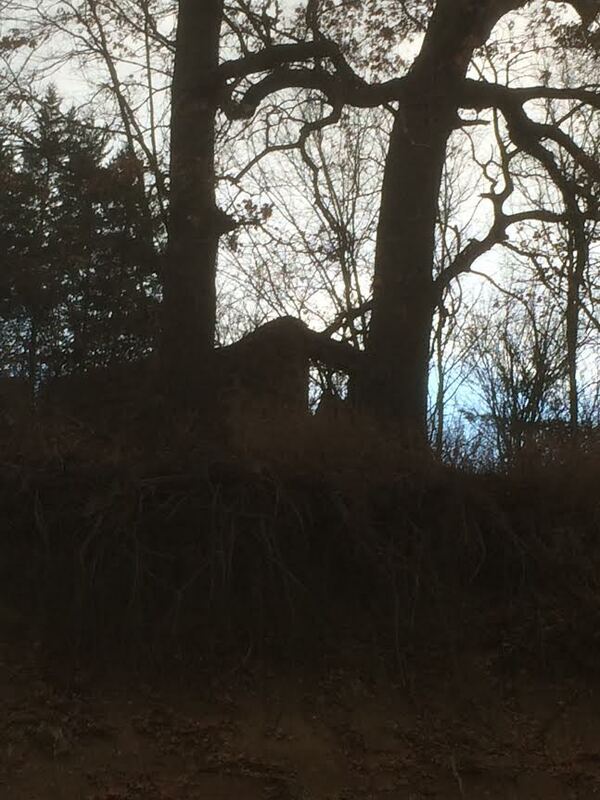 The remnants of an old stone house stand on the east bank of the river, probably not too far from Kane Elementary School. 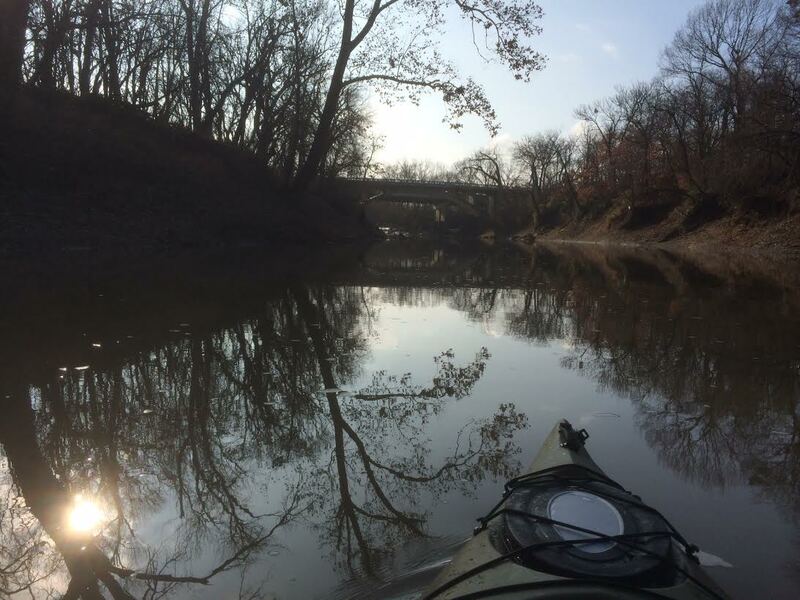 As we paddled south, the river became a bit cleaner, fewer tires and trash, the water less muddy. We hauled our kayaks on Pathfinder trail over to Silver Lake. Here are the piers of the old bridge just south of Frank Phillips Bridge. On Christmas day, three days after we made our first run from the Johnstone falls to Pathfinder bridge, we set out to finish the river, from Hillcrest/Sandcreek junction, all the way to the 2400 road bridge near gap road. 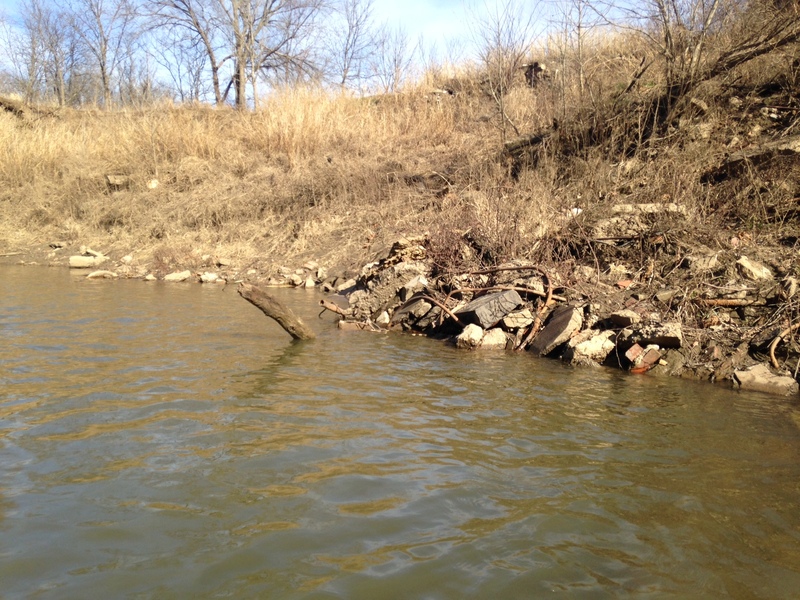 While still on Sand Creek, we spied an old cemetery headstone lodged against some debris. We didn’t see the name, but the person was born in 1860 and died in 1950. 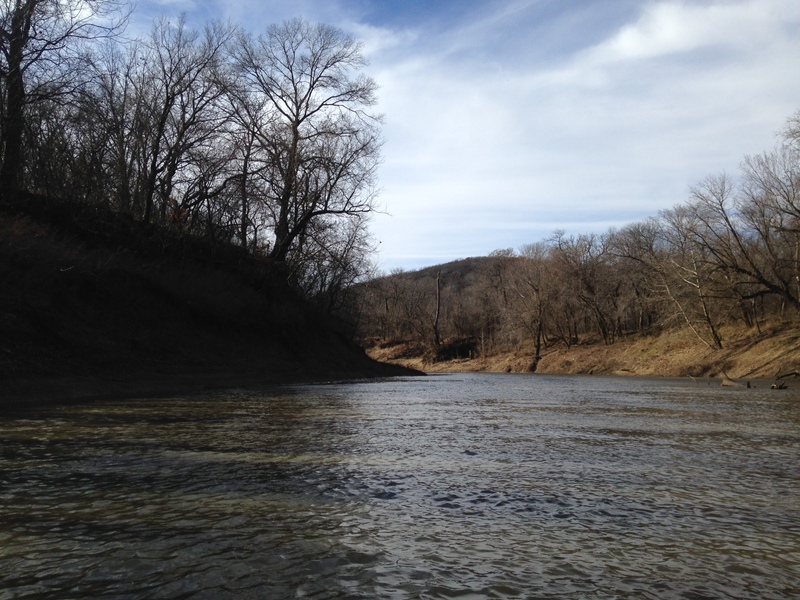 Turning south onto the Caney from the intersection of Sand Creek, the river flows faster and wider. This section of the river is really pretty and we saw a large heron, a couple of turtles, and a coyote running parallel to the bank, until seeing us, and the coyote scurried into the woods. The banks of the river are very steep, more imposing when viewed from water level, hard to climb up and out. Brandon exited to get a view of the topography west towards Circle mountain and snapped a picture of me circling below, waiting on his return. 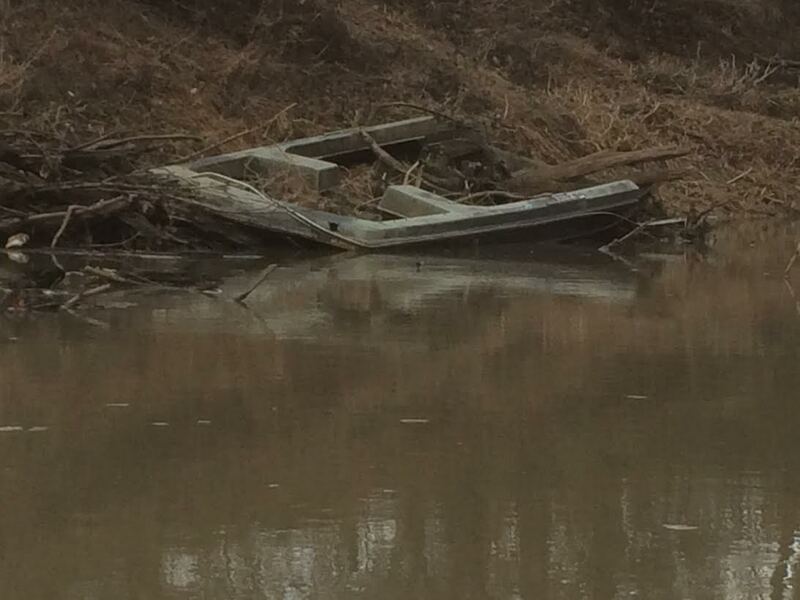 We dragged our kayaks up the muddy bank east of gap road 2400 bridge. The sun was fading quickly, and we borrowed a neighbors field and woods, a short cut to the truck we had shuttled along 2400 road next to the bridge. Brandon found an old camouflage hat, probably someone dropped while hunting. He put it on and we got in the truck and headed home. 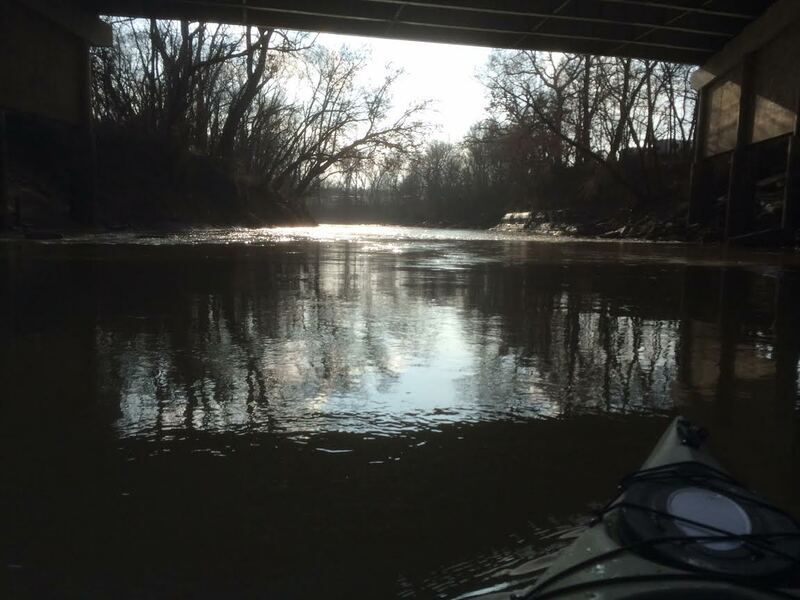 We started the day around a Christmas tree and ended it paddling down a cold coffee river. 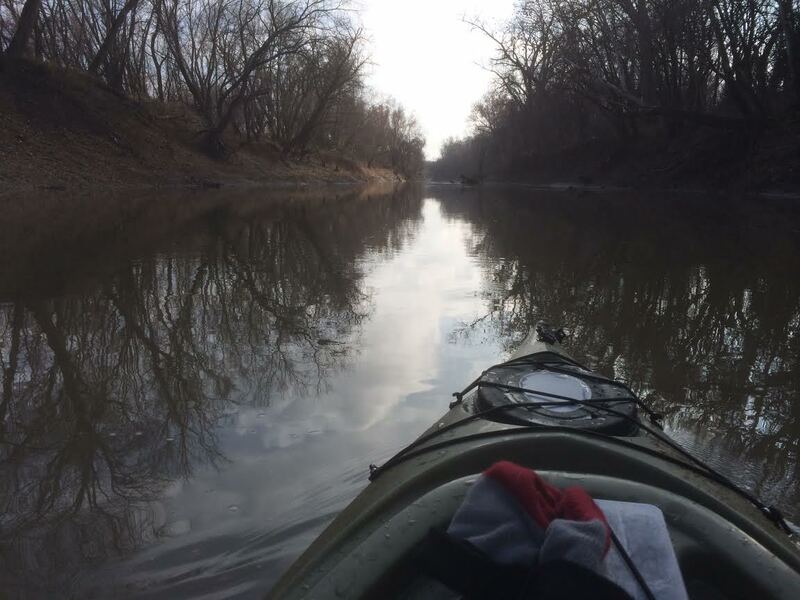 It felt good to paddle 8 miles with my son on a river I’d noticed in passing while growing up in my hometown, but had never really seen up close, until now. 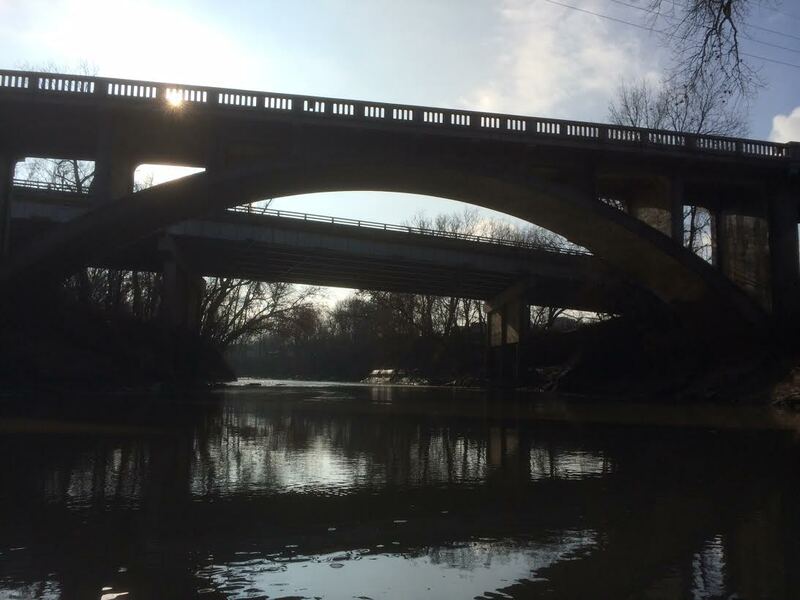 Until around 1952, the town of Caney dumped raw sewage into the Little Caney River. 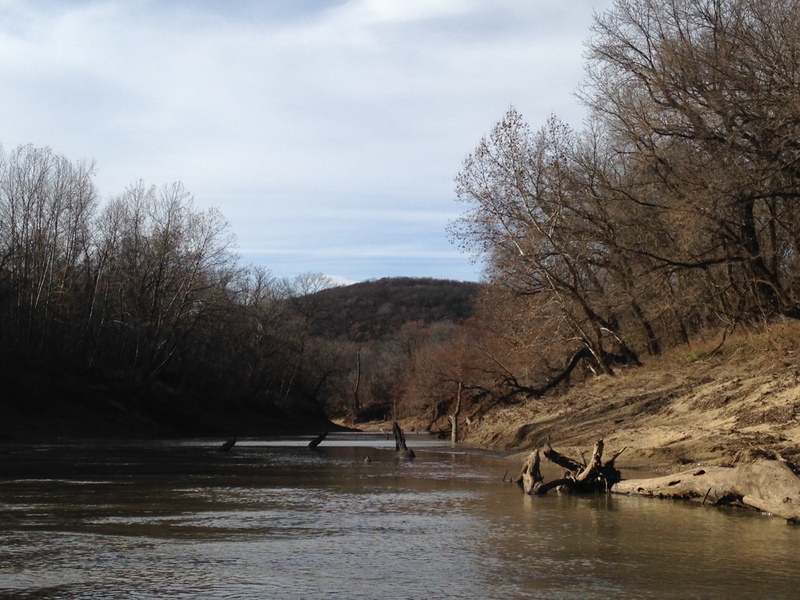 I remember a teacher whom I respected mightily avowing that “a river will clear itself every five miles.” So, we flushed and forgot, while our neighbors in Copan, Dewey and Bartlesville gulped down our pee and poop. 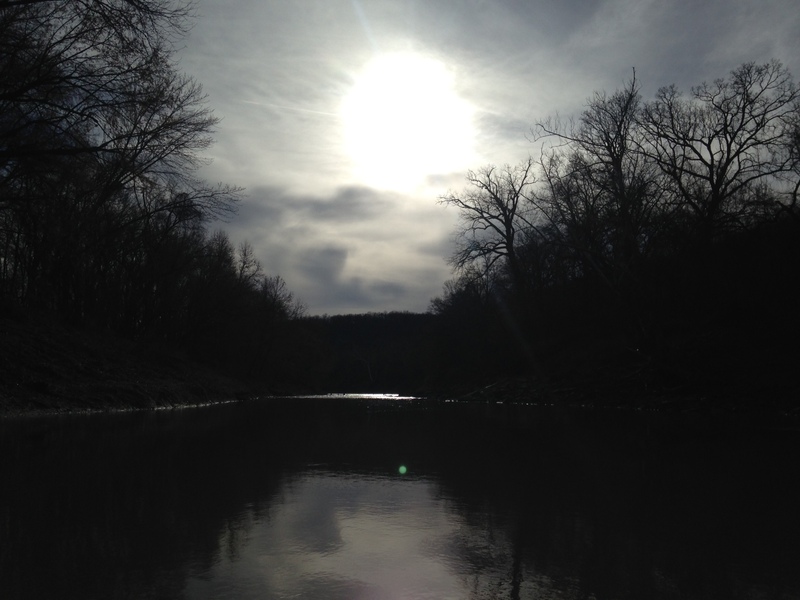 When we lived up in Kansas, we would put our canoe in at Elgin and go down the Little Caney. We were mostly putting in jugs and limb lines so we never went all the way down. It would make a good 2 day summer trip.